The saga of a Southern community driven from boom to bust by the war is not unfamiliar, but The Confederates of Chappell Hill, Texas by Stephen Chicoine, benefits from an opulent infusion of contemporary evidence never before published. That makes Chicoine’s story worthwhile. Soldiers from Chappell Hill went to war in the renowned Terry’s Texas Rangers, in Edwin Waller’s Texas cavalry battalion and in other Texan organizations. Chicoine devotes chapters to their experiences at Arkansas Post, in the amazing operations around Galveston and at Vicksburg and Atlanta. A fine chapter on the home-front experience cites 17 manuscript sources. A company of Washington County men also went to Virginia as part of the 5th Texas Infantry, which became a veteran mainstay in the justly famous Texas Brigade commanded by General John B. Hood. The five chapters devoted primarily to the exploits of Chappell Hill’s 5th Texas troops probably will appeal most to Civil War readers. Twenty war-dated letters written by three men, printed in pleasingly long block quotes, buttress the story of the 5th Texas’ experiences in Virginia, Maryland, Tennessee and Pennsylvania. They cover much of the war … Chicoine also supplies a gratifying volume of contemporary evidence from periodicals, most of them published in Houston or Galveston … Between the manuscript letters that Chicoine includes and the newspaper accounts, Confederates of Chappell Hill throws new light on some of the most famous moments in the annals of Hood’s Texas Brigade and the Army of Northern Virginia … Chicoine devotes 70 pages to recounting the weary survivors’ return to Chappell Hill, the Federal occupation and Reconstruction, and the eventual emergence of reunions and veterans’ organizations … Numerous excellent photographs, many of soldiers in uniform, illustrate Confederates of Chappell Hill … the book surely is worth the tariff. Lyndon Johnson is reported to have said that Texas is not a southern state, rather a western state. I must take a slight exception to that – Texas is both a southern state and a western state. The Brazos Valley Counties, such as Washington County (Chappell Hill and vicinity), had economies built on King Cotton and slaves. An aristocratic society developed among the plantation owners, which would rival that of any southern region. The village of Chappell Hill could have been uprooted and placed into the states of Louisiana or Mississippi without any feelings of dislocation. Thus, I would argue The Confederates of Chappell Hill, Texas tells a larger story than that of the people of Chappell Hill. It is the story of the transition of an aristocratic society that is re-shaped by the War for Southern Independence, defeat and reconstruction and the attempts at reconciliation that continue to this very day. This is a marvelous book, a social history of the Southern people before, during and after the great war – a war considered by many to be the most important event in American history. This book is important in light of the current popular trends. The message needs to be communicated that Southerners were human beings often motivated by the purest reasons. They fought, bled and died for their principles. The South grieved over their dead and reconstructed and even attempted to reconcile. Too often this message is downplayed or ignored. Chicoine delivers this powerful message by the many powerful eyewitness accounts therein. This manuscript is more than a military history, although the author demonstrates a masterful knowledge of the battles fought in both the eastern and western theaters. Life in Chappell Hill during the war gives us a good idea of the desperation felt by the wives and mothers. It also conveys the message that slavery was not the only dividing issue that brought on the war. The home front chapters are particularly poignant as they offer some insight into the complex Southern psyche, the mindset of the only Americans to ever lose a war. The veteran reunions after the war’s end are particularly emotional. One sees the gray-bearded men casting off the infirmities of age for a few moments to re-live the adventures of their military life with their comrades-in-arms. The block quotes are one of the strengths of the work. Voices from the grave relate to us what they saw and what they felt through the eyes of a 19 th century Southerner. The reader does not have to rely on some pre-digested text that could be the work of a biased author. The book is in a format akin to the television series on the Civil War so masterfully done by Ken Burns. The book is not the work of a partisan writer, but is well balanced. It is well organized, well written and includes much historical material never before seen in print (journals, diaries, memoirs, correspondence). The scholarship is excellent. The author recognized the importance of newspapers of the time as valuable sources of information. He mined these sources well. The text is very well organized. Without the author’s masterful management of these sources, the book could have turned into little more than a collection of recollections. The Confederates of Chappell Hill is a significant contribution to the culture of the Southern States and the thinking and experience of those Americans who chose to leave the United States. It is a staple for any writer wishing to develop the historical background necessary for a novel, perhaps a Texas version of Gone With the Wind or a Faulkner style novel set in Texas. The narrative does not require special knowledge to follow the story line. As I reflect on this book, The Confederates of Chappell Hill reminds me of a prose version of Edgar Lee Master’s classic Spoon River Anthology (1915). The near- deserted town of Chappell Hill, which the world has now passed by, and the neglected cemeteries filled with its illustrious dead, each of which has a life story to relate, is a striking analogy. Other social histories of the American Civil War include such classics as Life of Johnny Reb by Bell Wiley and the works of Joseph Glatthaar, but these books deal more with military history and do not cover the span of time, which The Confederates of Chappell Hill covers. The multi-volume series on Hood’s Texas Brigade, written by Colonel Harold Simpson, probably is the closest to The Confederates of Chappell Hill. This book compares favorably with any of the aforementioned books. Excellent book . . . I thoroughly enjoyed The Confederates of Chappell Hill, Texas. The chapter National Reconciliation was the best ending to any Civil War book I have ever read. I loved the way Chicoine told the reader about the lives of these soldiers after the war (including their descendants in the Epilogue), and the quotations used throughout the book, especially in Chapter 18, were outstanding. Review on Amazon by Joseph L. Owen, National Park Service historian and author of several Civil War books, including Texans at Gettysburg: Blood and Glory with Hood’s Texas Brigade (member of Amazon’s Vine Voice, an invitation-only review program). “Confederates of Chappell Hill, Texas: Prosperity, Civil War and Decline” by Stephen Chicoine is a fascinating “snapshot” of a southeastern Texas town that was a prosperous antebellum center due to cotton and proximity of the Brazos River that connected the town to Galveston thus cotton and other cargo could be transferred back and forth to the Texas coast and shipped nationally and internationally. Many of the men in Chappell Hill were active in the Texas Revolution and Mexican War and were known statewide and nationally. During the 1850’s cotton planters from other southern states moved and settled in the Chappell Hill area and began to flourish economically and socially. Chappell Hill would turn from a small frontier Texas town to a town that modeled the prosperous medium towns of the antebellum south. The planters would also bring their slaves with them to work the plantation fields. Slaves would make up 30% of the population of Texas before the Civil War. With plantations and prosperity, owners of plantations and other prominent officials looked warily towards national events in the eastern United States when abolitionists and other forces gained in power and influence from the Union. Men in Texas would enlist in the infantry, cavalry, and artillery regiments. Chappell Hill would answer the call from Austin and Richmond and many of her sons enlisted in regiments that fought in the eastern and western theater of the Civil War. The soldiers from Chappell Hill such as Daniel H. Browning, William Browning joined such famous regiments such as Terry’s Texas Rangers. Other soldiers such as William C. Chappell and A. J. Robertson would join Sibley’s Brigade and be in the famous New Mexico expedition. Other soldiers such as Rufus King Felder and his cousin Miers M. Felder joined the famous Hood’s Texas Brigade, many other men from Chappell Hill joined various regiments from Texas and would fight in various battles throughout the war. Through letters home these men would describe their daily camp life, fierce battles, and the heavy toll of disease that ravaged many regiments. Mr. Chicoine also described the suffering that slowly but surely as the war progress would inflict on Chappell Hill. The shipping of cotton to Galveston would stop, imports and exports of goods would be strangled, and the town felt the effects of the war keenly. Many of the men from Chappell Hill who would join the army of the Confederacy never returned home, and those that did return were different than when they were the “eager recruits” in 1861. After the war, reconstruction and other U.S. policies changed the town in various ways. A vicious case of Yellow Fever swept through the town, poverty became a common place. Chappell Hill was no different than other southern towns who found the reconstruction policies difficult. Many who were rich before the Civil War found that after the war, that their fortunes were forever lost and had to adjust to just make a living in order to survive. The veterans of the armies of the Confederacies began to hold reunions and meet with their old comrades and talk about prior victories in the war as well as losses on the battlefield. Eventually, Chappell Hill would become “normal” again and many of the sons and grandsons of the Confederate soldiers enlisted in the Army, Navy, Air Force, and Marines and fight for the Stars and Stripes. Fourth of July parades would become a yearly event and the town celebrated, but many would always remember that for four years they were a proud part of the Confederate States of America. The author has done an excellent job of giving the history of this southeastern Texas town and how the War Between the States affected this town and the men and women who lived, fought, and in many cases died in the causes they believed in. This is an excellent book that is recommended to anyone interested in Civil War and Confederate History, Texas History, Civil War Texas History, and the socio-economic effects of the Civil War to a southern antebellum and post-Civil War reconstruction tow. Stephen Chicoine’s The Confederates of Chappell Hill, Texas examines the changes that Texans experienced during the Civil War and the events that followed through the lives of the citizens from Chappell Hill. Before the war, Chappell Hill thrived because of the Southern cotton trade but the disruption of the Civil War and Reconstruction brought hardships to the town. Through the letters and memoirs of its citizens, Chicoine brings to life the thoughts, actions, and emotions of individuals from this town throughout these trying times. The author previously published several books and articles on military history, including the edited letters of Rufus King Felder, a Confederate soldier and leading citizen of Chappell Hill after the war, in the Southwestern Historical Quarterly. Men from Chappell Hill served in every theater of the war and in all the famous Texas units including Hood’s Texas Brigade, Terry’s Texas Rangers, and Sibley’s Brigade, to name a few. The men participated in famous battles such as Vicksburg, Gettysburg, Galveston, Chickamauga, Wilderness, and Petersburg. Chicoine devotes the majority of the book to the men’s perspective of their particular units and the battles they fought. Included in this section are the effects the war had on the home front and how civilians supported their soldiers on distant battlefields. The last five chapters examine how the men reacted to coming home after the war, reconstruction, and how they contributed to the reconciliation between North and South through the establishment of veteran organizations. Chicoine concludes the book with the contribution of the Confederates’ children and grandchildren to the reconciliation of the country through their actions during the Spanish-American War and World War I. The greatest strength of his book is examining their lives after the war and how they adapted to the changes the war created. His research is impeccable. The author drew from many different sources to examine these Texas soldiers’ lives, especially the letters of common soldiers and newspapers from the area. Another positive attribute of the book is the number of photographs incorporated throughout its pages. Pictures of soldiers, families, locations, and buildings within the town bring the story to light and provide a physical connection for the reader. Chicoine organizes the book both topically and chronologically. This style allows him to focus on the numerous groups of Texas soldiers spread across the South while containing a narrative that shows the progressive changes that occurred to the men and the town they called home. Stephen Chicoine draws upon a wealth of primary sources from the local archives and the historical society of Chappell Hill, Texas, to provide a personal account of this significant town’s contribution in the American Civil War. 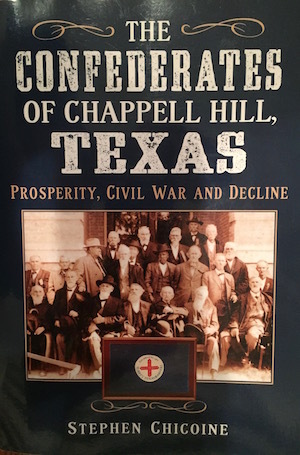 In doing so, the author attempts to place Chappell Hill in the larger context of Texas in the war and the southern experience of prosperity, war, and decline. The bulk of the monograph traces the experience of men from Chappell Hill through a synopsis of the minor and major battles. In doing so, Chicoine touches on several interesting topics and does an excellent job of discussing the prison-of-war experiences of Confederate soldiers. Through personal accounts he discloses the hazards of prison life and the harsh conditions in which men suffered brutal treatment and malnourishment and literally froze to death. In all, we find that men from Chappell Hill served throughout the Confederacy in several capacities, experiencing the full effect of war. With the close of war and the homecoming experience, the author reveals the difficulties that men encountered while traveling back to Texas. Once home, these men faced starvation, possible indictment for their wartime activities, loss of loved ones, loss of land and business, and no employment–a reflection of the Texas and southern experience, from the author’s perspective. When it comes to the decline of Chappell Hill, however, Chicoine argues that the yellow fever epidemic of 1867, not the consequences of war, ravaged the town. Chicoine reveals, in one of his better and more enlightening chapters, that the epidemic held no respect for class and that even in this crisis, Chappell Hill residents played roles beyond their community. For example, President Rutherford B. Hayes appointed Richard M. Swearingen, a civil war veteran, to a commission of experts (to investigate yellow fever) that eventually established the National Board of Health. Nevertheless, Chappell Hill was hard hit by the 1867 epidemic and became known as an unhealthy place to live, the most significant factor in the town’s decline. Despite the author’s neglect to consult the leading secondary sources on many topics, he has done excellent primary-source research in dissecting one town’s contribution to the war effort. Chicoine’s monograph on Chappell Hill, Texas, which he portrays as a microcosm of the Confederacy, allows the reader to understand the real experience and impact of war from a personal and local perspective, a work that will interest Texas historians and general Civil War enthusiasts.